While the world watches and worries as tensions between the Koreas reach a boiling point (I’ve been a constant visitor to Voice of America’s Twitter feed all day) I figured everyone could use some good news. I’ve been charmed by the ggachi since we first came to Korea. I’d never seen one before, and although they look pedestrian at first glance — like an outsized raven, maybe — upon inspection they’re beautiful birds. Striking white markings cover their underbellies and their wings are tipped with shimmering blue. What my co-teacher said intrigued me, and I decided to do a little research of my own. 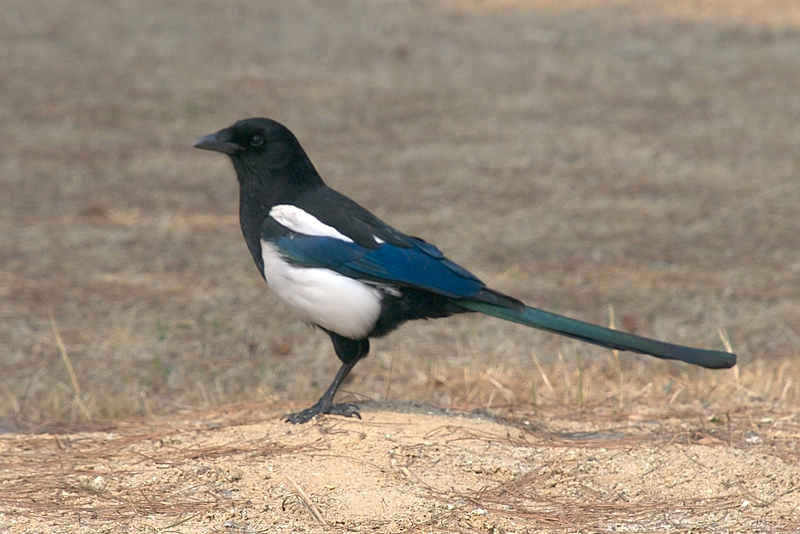 Turns out that these bearers of good news and welcome guests are Korean magpies, or pica pica sericea. Of course, I was surprised to find that the Western symbol of greed, frivolity and vanity is one and the same as a Korean symbol of good. So, as I sit here glued to my Twitter feed, fretting over North Korean nukes (and my English Winter Camp lesson plans) I’m hoping that Koreans got it right: maybe my magpie friend will bring a bit of good news. Next post And the deskwarming begins ….